PALM SPRINGS, CA ~ Game one on the auxiliary field saw the Palm Springs Power defeat the British Columbia Bombers in walk-off fashion by a final score of 2-1. Alex De La Cruz-Rodriguez drove in the games first run in the sixth on a double steal. That lead wouldn’t last long as the Power mounted a comeback in their final at-bat of the game in the seventh. Jacob Boston hit an RBI triple to score Lamar Briggs tying the game 1-1. Two batters later, pinch-hitter Won Jie Choi drove a walk-off single into left field to bring Boston home and secure the Powers first win. Winning pitcher Konner Arnold added six innings of stellar baseball for Palm Springs, only allowing four hits while striking out six batters. Although Travis McQueen suffered the loss for the Bombers, he had a solid outing as well, only giving up five hits while recording nine strikeouts and zero walk. 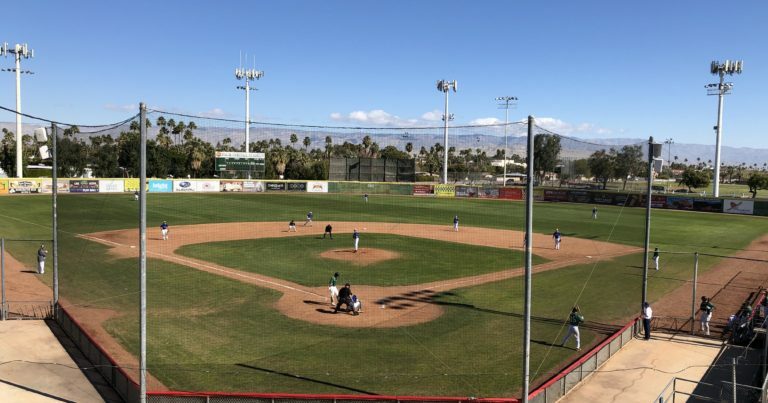 The first game at Palm Springs Stadium turned into an offensive showcase, featuring 21 combined runs, with the Oregon Lumberjacks taking down the Manitoba North Stars 14-7. For the Lumberjacks, Ayumi Nakamura and Kevin Riley combined to drive in eight of their 14 runs. After striking out in his first at-bat, Nakamura went 4-for-4 with four singles, four RBI’s and two runs. Riley contributed with a grand slam home run in the 4th. Jacob Karlson for the North Stars went 3-for-4 with two doubles and two RBI’s. Jonathon Howard earned his first win after tossing 2 ⅓ innings in relief with two strikeouts. Grant Gamble took the loss for the North Stars after giving up eight runs over 3 ⅓ innings. The Toronto Rush picked up a 5-1 victory over the New York Colonials in the second auxiliary field game. Grady Caldwell got the Rush on the board in the second inning when he hit a double to deep centerfield, scoring both Andris Rizquez and McClain Bradley. Toronto added three more runs in their half of the fifth inning on an RBI single by Bradley, a double-steal, which brought Jesse Russo home, and a fielder’s choice off the bat of Grady Caldwell. The Colonials added their lone run in the top of the seventh when Dante Biagini’s sharply-hit ground ball scored Elijah Collins from third base. Sam Steeves started on the mound for the Rush and earned the victory, going four innings and striking out four batters. Elliot Forde was the losing pitcher for the Colonials, but only three of his five runs given up were earned and he struck out seven batters. The second game at Palm Springs Stadium offered a low scoring pitchers duel won by the Alberta Grizzly over the Washington Blue Sox 2-1. Grizzly starter Alex McCune went the distance allowing only four hits in seven innings with eight strikeout and no walks. After a two-out single in the second inning, McCune went on to retire the next 15 Blue Sox hitters he faced. He finished off by setting down 16 of the final 17 batters in the game. Starter Shinya Toyama and reliever Gen Utamura eached pitched three inning for the Blue Sox. Toyama struck out six batters, walked one, and gave up two hits. Utamura suffered the loss after giving up one hit while striking out another. Wesley Brown drove in the winning run for the Grizzly in the bottom of the sixth inning with a two-out single.